Lee County, Iowa, was established in 1836. Based on the 2010 census, the population was 35,862. Lee County was created on December 7, 1836. The county has two county seats - Fort Madison and Keokuk. The county is named in honor of William Elliot Lee, a land dealer who owned an area of Iowa that included the future county. Lee County is part of the Fort Madison-Keokuk, IA-IL-MO Micropolitan Statistical Area. It is believed that the county is named for William Elliot Lee of New York. His land company, Marsh, Lee and Delevan had extensive holdings in Iowa's "Half-breed Tract." This Tract later became part of Lee County. The first permanent settlement within Lee County was at Keokuk in 1829. The county was established in 1836 and originated in 1838. The town of Fort Madison was named as the seat of justice by the Legislature of the Territory of Wisconsin on January 18, 1838. There was much controversy over the location of Fort Madison as the county seat. Residents away from the Mississippi River complained that it was too far away from the center of the county. The locating commissioners then declared Franklin as the county seat. Dissatisfaction just increased following this; no county building was ever built at Franklin. The matter was settled at a special election. Contenders for the county seat were Fort Madison, West Point and Franklin. Prior to the election Fort Madison pledged $13,559 towards a new courthouse, if it was located there. Fort Madison won the election, and construction began in July 1841. The building was completed on September 3, 1842. This did not end the county seat battle, however. A group from West Point petitioned the Legislative Assembly of the Iowa Territory to remove the county seat to West Point. The assembly agreed and named West Point as the new county seat. West Point agreed to build a brick courthouse with a stone foundation. It was to be completed by September 1, 1844. Fort Madison was to remain the county seat for one more year, then the courthouse would be sold with two-thirds of the proceeds going back to Fort Madison. That auction never took place, and West Point was never the county seat. During that year the appeal of West Point as the county seat faded so the county seat remained at Fort Madison. Another special election was held to relocate the county seat. The contenders this time were Charleston, Franklin, Keokuk, Montrose, West Point and Fort Madison. Again Fort Madison was named the county seat. The population of Lee County became so high that a rivalry for the county seat soon developed between the population centers of the county, Keokuk and Fort Madison. Because of this, the General Assembly passed a special Act, establishing two county seats in Lee County. One was at Fort Madison and the other at Keokuk. This makes Lee County the only county in Iowa to have two county seats. The present courthouse at Keokuk is the renovated Post Office building built in 1890. The original courthouse at Fort Madison was designed by Father Samuel Mazzuchelli. County offices were moved in 1978 to a newly-constructed county office building. The old courthouse is still used for court-related functions. 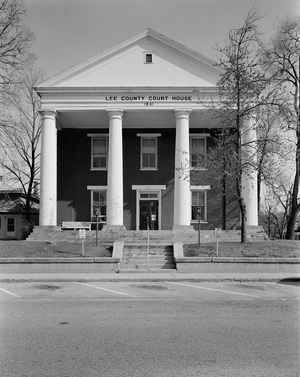 Even though there have been numerous court battles and editorials over the county seat question, both towns function as the county seat of Lee County. As reported by the Census Bureau, the county has a total area of 539 square miles (1,400 km2), of which 518 square miles (1,340 km2) is land and 21 square miles (54 km2) (4.0%) is water. Lee county is located in southeast Iowa. The lowest point in the state of Iowa is located on the Mississippi River in Keokuk in Lee County, where it flows out of Iowa and into Missouri and Illinois. Northeast: Des Moines County; Henderson County, Ill.